Single Hung Windows Add A Beautiful Look To Any Home. Whenever it comes to home improvements, all of the different choices out there for types of roofing and siding can leave your head spinning. One of the most important aspects of renovating or taking care of a home is your windows, but it is often the last thing to be thought about. When you are considering what type of windows would work best for your home, why not consider single hung windows as an option? The name single hung refers to the way the window opens, which for a single hung window is only the bottom panel. Single hung windows are one of the more popular types of windows on the market, due to their low cost and versatility to match any type of home. What Are The Pros And Cons Of Single Hung Windows? Single hung windows, like anything, have a lot of great qualities but also have some setbacks that homeowners should be aware of before deciding to commit to installing them in their home. In order to provide more knowledge for homeowners to help them make an educated decision when deciding the best window for their home renovation, we have conducted a list of pros and cons for single hung windows. When it comes to being economically friendly, single hung windows are the best in the market. They generally cost 10-20% less than your standard double hung window and come with a warranty that lasts about the lifespan of the window. This allows you to correct damages without the financial strain. The lifespan of a single hung window can be between 20-25 years, which vary on how well you, as the homeowner, take care of the window. Regular maintenance, such as routine glass cleaning, can help your window live longer than its projected lifespan, helping you get the most out of your investment. Often times what people refer to as a single hung windows’ greatest weakness turns out to be one of its greatest strengths. Single hung windows only open from the bottom sash, meaning that it has less moving parts than a double hung window. While this may make it harder for a single hung window to accomplish some things, the one thing it does allow the window to be is extra durable. The only thing you really have to worry about being damaged on a single hung window is the frame, the sash, or the glass panel cracking. Note, to ever tell if your window has a damaged sash, all you have to is try to open it. If it is difficult to open, it means that the sash is either cracked or the window itself has been thrown off of the track. When this happens, it is time to call in a window specialist to help you fix the problem, such as your trusted team at Armstrong's Glass & Mirror. Single hung windows only have one entry point, the bottom sash. Because of this, it is easier to reinforce the window so that it doesn’t open, by locking the sash. This makes it harder for potential burglars and thieves to enter your home. For smaller homes, trying to find a window that can fit in your space can be extremely difficult. Single hung windows come in a variety of different sizes which makes them easy to install in any sized space. These are particularly good windows to invest in if you are building a tiny home or an on property apartment. Not only are single hung windows able to fit in just about any space, but they also come in a variety of different styles, helping you pick the perfect one for your home. Here is a quick run-down of options for you. Eyebrow single hung windows have a curved top. Special shape allows you to decide which geometrical shape to use for your window. Arch is just how it sounds. Gothic Single Hung windows have their arch a bit more angular, giving them an old-timey church feel. With fewer moving parts, single hung windows boast durability and also making harder for your home to spring a leak. 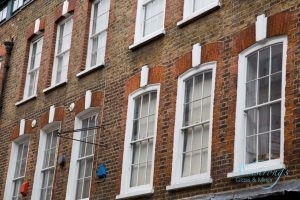 As mentioned before, there are a few setbacks that come with owning a single hung window. One of these is the limited amount of ventilation that you get. For larger homes or even bathrooms, this type of window may not be the best. The limited ventilation can cause moisture to get caught in your home, leading to mold or mildew in severe cases. Single Hung Windows Are Versatile And Durable. Single hung windows and double hung windows both have their advantages and disadvantages. When it comes to which one is the best, it is more dependent on what you are looking for in your window to be the deciding factor. If you are looking for economically efficient, then the single hung window is the way to go. Looking for better ventilation, then you would go with the double hung window since it has the ability to open both the top and bottom sash. If you are looking to replace or repair your windows in Fort Worth, TX then turn to a team of window experts you can trust. At Armstrong's Glass & Mirror, we specialize in all types of windows and we can work with you to find the perfect window to fit your space and your needs. If you would like a free estimate on a window or have more questions, call us at 817-937-6267 to speak with a representative today. Posted in Uncategorized on February 6, 2019 at 8:08 pm by Armstrong Glass. How Do You Clean Up Broken Glass? Windows are the most fragile part of our home exterior, yet they play an essential role in our daily energy-conservation. They also connect us to the world outside our house. That connection can be suddenly severed however, when a bird, clump of hail, or another object slams against the side of the property. Trees are particularly troublesome if their branches are too close to the windows (one more reason to your local Fort Worth, TX tree health professionals). When that day comes and your windows pane has been smashed into a thousand tiny pieces on the floor, it’s easy to lose your composure. Knowing what to do ahead of time can save you a lot of grief. Today, we’ll be answering some of the most frequently asked questions in the industry when you need broken glass repair. Afterwards, you’ll have a clear plan of action if you ever find yourself in this small crisis. Damage To Your Beautiful Windows May Be Frustrating, But You Need to Keep Your Safety in Mind. There’s the issue of preventing any immediate further damage to your window, plus cleaning up the debris around the floor. Keeping your cool and thinking clearly is very important during this phase, as you could easily cut your hands or feet during the cleanup. Start by grabbing a pair of rubber gloves. If you don’t have any shoes on, shoes are a must! Flip flops don’t count. You’ll also need a vacuum, a utility knife or chisel, and at least two plastic bags. How Do You Keep Broken Glass From Spreading? Equipped with shoes, gloves and a double-plastic bag, pick up larger pieces of debris that have fallen onto the floor. For the smaller pieces, use a vacuum (NOT a broom) for cleanup. As for the remaining pane in the window, you’ll need that utility knife. Start by carefully removing the putty and fasteners around the edges of the section. Remove the pane and place it into your double plastic bag, if possible. You can then cover the area by taping multiple layers of plastic over the exposed area. Heavy trash can be used as an alternative. Can You Put Broken Glass in Recycling? If you really dislike your recycling pickup company… just kidding. No, you should not try to recycle your broken window pane. Wrap all the debris from the broken or cracked pane in a sealed box and dispose of it in the regular garbage. Replacing a Single Pane is Considerably More Cost-Efficient Than Replacing Full Windows. You can have a hefty handful of window repair companies ready to go with a single Google search. These experts provide some much needed expertise and ensure that the dimensions of your new window pane are measured and reproduced accurately. They also have the scoop on the latest home trends. Can You Just Replace the Glass in a Window? Yes, assuming the window frame itself isn’t damaged. While it is possible in most cases to install a new pane without replacing the entire window, there will be some extra work to be done. How Do You Replace a Pane of Glass? First, the old glaze putty and fasteners that seal the window in place have to be discarded. 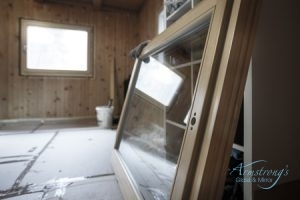 After the carefully sized pane replacement is ready to install, brand new glaze and fasteners must be prepared as well. In many cases, the window itself will need to be removed briefly to install the new pane. Your professional repair company should provide some temporary covering to prevent air from escaping and bugs from entering. How Do You Fix a Broken Glass Pane? There is no “fixing” a broken pane. It must be replaced using the steps listed above. How Much Does it Cost to Replace a Pane of Glass? According to Fixr.com, the national average is $350-$450. You can customize your search to includes specific window type, location, the number of windows to be replaced, your timeline for repairs, etc. Bottom line: if you are simply asking for glass repairs, you’re going to be paying in the hundreds per window. Low-E Glass Has a Hazy Look, But It Also Blocks Harmful UV Rays That Fade Your Interior Decor. If you’re a fan of strong insulation, consider argon-filled and triple windows, though the argon category is the most expensive. Triple is pretty energy efficient too. On the other hand, laminated and tempered window glass is very durable against impact damage. This is especially handy for areas for intense wind speeds and frequent hail damage. Lastly, low-e windows provide excellent protection against UV radiation which can fade flooring and furniture inside your home. They’re also the cheapest category. Ultimately, the ideal choice of glass will hinge on your personal tastes and functional needs. Schedule Your Window Pane Replacement! Have your windows been damaged by a recent storm or an unfortunate accident? Our team at Armstrong's Glass & Mirror would be happy to talk with you about arranging broken glass repair for your home! For information about pricing, scheduling, and the general process, talk with one of our experts at 817-937-6267. Posted in Uncategorized on December 6, 2018 at 9:57 pm by Armstrong Glass. Why Did My Shower Glass Shatter? Know Someone Who Had a Shower Door Shattered? There Are Ways To Prevent This. We take a shower we never expect that our shower door is going to shatter. No matter how crazy that sounds, it does happen. It’s a very rare occurrence but there have been several occasions in the United States where a shower door shattered. It is a federal law that every glass shower door be made from tempered glass. This is due to how safe it is and that if it doesn’t break or shatter, the pieces will be too small to hurt you. While tempered glass is safe it holds a ton of energy within it. Because of how much energy is held, a tiny crack or nick in the glass has the potential to shatter glass shower doors. These types of damages can form at the edge of your shower door. 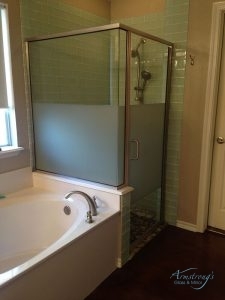 While it has happened, it doesn’t mean you should forgo glass shower doors. There are ways that you are able to prevent a glass shower door from shattering. Inspect Your Shower: You can do this or a glass specialist can do this, but it is important to have the edges of your glass shower door checked annually to see if there are any cracks or damages. Invest in a Safety: In order to ensure that your door is safe and won’t shatter, you can have a glass specialist apply a safety film of the glass. If the glass does happen to shatter, the safety film will prevent the glass shards from falling and will keep them together. If your shower door shattered, its best to call a glass specialist. This type of job needs to be left up to professionals. You wouldn’t let just anyone handle your Fort Worth, TX heating services, so when you need glass repair service in Fort Worth, TX, call Armstrong's Glass & Mirror at 817-937-6267. Posted in Uncategorized on October 11, 2018 at 7:21 pm by Armstrong Glass. Putting in Some New Windows? Start Planning Your New Window Treatments! Are you on the hunt for ideas to freshen up your home design? Before you go knocking down doors and busting up bathtubs, try starting with something simple: your window treatments. Window treatments are a remarkable easy way to spice up the curb appeal of your home, without blowing out your budget. Here are some of the most exhilarating ideas we’ve found! What are Exterior Window Treatments? When it comes down to it, most windows look the same. Shrewd decoration is what sets a home apart from the rest. 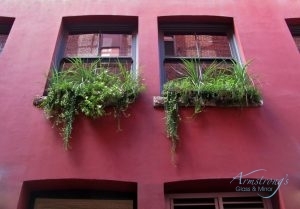 With some fresh inspiration (and perhaps a little tree pruning), you can transform even the plainest of windows. There are countless styles of window treatments to choose from, from simple wooden shutters to elaborate flower box arrangements. Some of our favorites treatments include sliding window covers, classy wrought iron grills (which double as extra security), holiday-themed decoration boxes. If you’re looking to start with something simple, try installing a shelf that holds potted plants. Of course, the inside of your windows deserve just as much attention. Many decorators hang up basic curtains and stop there. There are so many ways to have fun with your curtains alone! First, try getting creative with your new curtain material. HGTV has a fantastic article on ways to accentuate your windows, including several unique materials (such as hand painted linen or re-purposed sheets). You can also tie your sheets back with some unconventional objects from around the house. Get Your Estimate on Window Replacement! As you prepare for your double or single hung window replacement, consider one of these invigoratingly colorful ideas for your exterior window treatments! Looking for a local glass company to replace your windows? 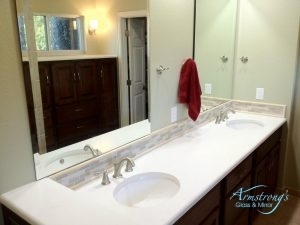 Give the Armstrong's Glass & Mirror team a call at 817-937-6267 for your home estimate! Posted in Uncategorized on September 7, 2018 at 6:56 pm by Armstrong Glass. Have you been noticing lately that your energy bill is high, but yet you haven’t changed anything in the house? Or are certain areas of a room colder than others? These are all signs that you have a damaged or broken window. From something hard to spot like the sealant coming loose and allowing wind to blow through, to more noticeable signs like cracks in the glass, damaged windows can do a lot of harm. That inconspicuous gap allowing the draft in also allows room for insects to crawl in, and makes your air conditioning unit work harder to regulate the entire home’s temperature, increasing your energy bill. Cracks in windows are dangerous and unsightly. If you need window repair in Fort Worth, TX, call Armstrong's Glass & Mirror today at 817-937-6267. How Long Do Windows on a House Last? If You Have a Damaged Window and Need Broken Window Repair, Call Us Today! All window types will last a minimum of 20 years. If you opt for the more expensive ones that provide more protection, they will have double the lifespan. Vinyl and storm windows can last up to 40 years. Vinyl windows are the most common window types for American households because of their affordability, durability, and versatility in colors. They can hold up to storms pretty well, but will get more damaged by the sun’s UV rays and can get discolored. If you live in a particularly stormy area, consider getting storm protection for your windows. This window type is an extra window that is mounted inside or outside the existing window for an extra layer of protection. Roofs and windows often get badly damaged when severe storms roll through. If your windows have gotten damaged before in severe storms, storm windows won’t break when the next storm hits. Depending on the amount of damage, window repair can cost anywhere from $200 to $900. Factors that raise the price include the amount of damage, where it is, how many windows were damaged, and how many glass panes you have in each window. If you have custom windows that are a unique shape like diamond that get broken, prices will be very high as replacement panels will have to be custom made. Keep your family safe by getting window repair as soon as you notice it. 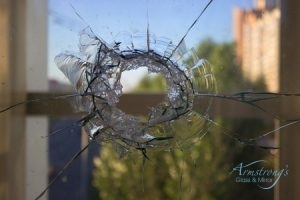 A broken window not only leaves your home vulnerable to burglary, but lowers your curb appeal and raises energy bills. 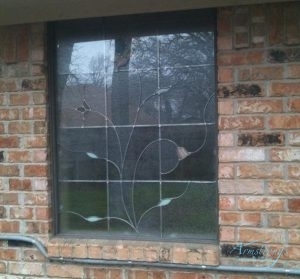 If you need window repair in Fort Worth, TX, call Armstrong's Glass & Mirror at 817-937-6267 today. Posted in Uncategorized on August 3, 2018 at 7:30 pm by Armstrong Glass. Both Low E Windows and Solar Screens Prevent Outside Heat From Heating Your Conditioned Air. Does that monthly energy bill have you tearing your hair out? There are many ways for homeowners to cut down on their daily energy consumption, but few look to their windows. With the right set of windows, you could experience tremendous savings and a more comfortable environment inside your home. Consider these two amazing premium window upgrades when you need help with your energy bill! Low E windows provide a wonderful opportunity to block outside heat and ultraviolet radiation from sunlight from entering your home. Their design still allows plenty of natural light into your home, however. Apart from their environmentally friendly materials: Low E windows come with two especially handy benefits. First, the incredible insulating effect created by these windows reduces the strain on your HVAC system, is it doesn’t have to compensate for lost cooled air. Second: by minimizing the amount of UV rays entering your home, your furniture is safeguarded against fading. Sometimes however, you’d rather stick with the windows you already have. Solar screens are fastened directly in front of your existing windows and door glass. Once installed, these screens begin to absorb outside heat and prevent it from passing through your windows. Without this surplus warmth infiltrating your home, your HVAC system doesn’t have to work as hard to maintain that nice cool air we all know and love. That means lower energy consumption and lower monthly utility bills. Who doesn’t love that? 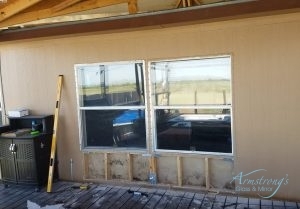 If you’re curious about these or other premium window upgrades, feel free to chat with one of our Armstrong's Glass & Mirror specialists at 817-937-6267. Posted in Uncategorized on July 2, 2018 at 4:39 pm by Armstrong Glass. When you have an abundance of glass in your home, you want to make sure that it stays looking its best. Since the second anyone touches glass it becomes dirty, it is a great idea to make sure that you have all the right tools to keep it as clean as possible so that it stays looking great in your home for as long as it can. When your mirrors are covered in fingerprints, it can be hard to see and can make an already clean house, feels dirty. There are a few quick and easy ways to keep this from happening. In The Bathroom – It all starts in the bathroom or wherever you choose to get ready in the morning. One of the best tips that we can offer for quick and easy glass cleanup is to keep a small bottle of glass cleaner on your counter or right under your sink to grab after brushing your teeth or touching the mirror on accident. This is a fast and simple way to keep your glass looking great no matter how big of a rush you are in. 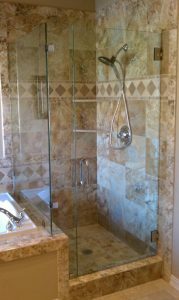 Glass Shower – Glass shower doors look great but they can also be a pain. It is important that you take good care of them or they will start to look terrible and eventually you will have so much water and scum build up that you cannot see out of it. If you have something like rain-x, that will be able to be sprayed onto your doors and cleaned easily after every shower. 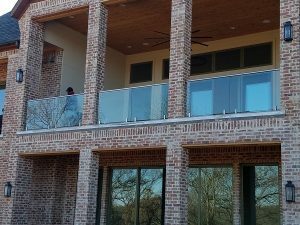 If you need glass installation or more tips on how to keep your glass clean, call Armstrong's Glass & Mirror at 817-937-6267 and we can help you. Posted in Uncategorized on May 29, 2018 at 2:09 pm by Armstrong Glass. Have you ever wanted a mirror in your home and you just don’t know where to start. If you have been on the fence about installing a mirror to your home consider that there are a wide variety of things that mirrors can add to your home. Size – If you live in a smaller home, adding a few mirrors around your home can actually make it appear bigger. The light will reflect off of the glass and create the illusion that a room is actually bigger than it is. That is why many people end up putting floor to ceiling windows in their home cause it opens it up and allows people to feel like they are in a bigger house when they actually are not. Style – If you are going for that modern bachelor pad style, mirrors make the person accessory to a modern sleek leak that you may have been looking for. Adding – Believe it or not, some homes actually do not come with mirrors inside of them. So you will need to add a mirror to every room that you would like to have one. Typically, those are the bathrooms and then a few bedrooms. Mirrors come in all shapes and sizes as well so they can fit your every need and want. If you are looking for mirrors for your entire home, Armstrong's Glass & Mirror has you covered. We can provide mirrors for your whole home and even install them for you so there is not work for you. Give us a call anytime at 817-937-6267 and we will be more than happy to help. Posted in Uncategorized on April 24, 2018 at 3:35 pm by Armstrong Glass. If you have been thinking about making a change to your home, consider changing out your old sliding glass door and adding french doors. If you have a wall that doesn’t bring in any light and maybe even leads to the backyard, wouldn’t it be great to add something that will open up your home in a completely new way? There are so many benefits when you add french doors to your home and above all else, they look great! Light – You can almost never have too much light added into your home. What a way to make a house feel warm and inviting than a ton of natural light shining in. If you decide to replace a window with french doors, you can add major light to the room that it is in. Enter – A great thing that many people decide to do is add french doors to their bedroom. This gives them a way to open up their room to the outside and also add another entrance to the home. If you want walk out back to do something or bring something into your room, your french doors will open right up with ease. Savings – French doors are a great way to actually save money on your electricity bill as well. Most doors are energy efficient and will help seal in the heat of your home, actually causing your energy bill to go down. 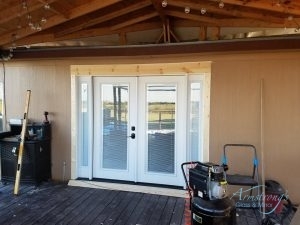 Unlike sliding glass doors, these will seal when they close. If you think french doors will benefit your home, give Armstrong's Glass & Mirror a call at 817-937-6267 and we can make sure it is done the right way. Posted in Uncategorized on March 20, 2018 at 4:31 pm by Armstrong Glass. When you think of the word glass, you often think of windows or something very breakable, but glass can be a great feature in a home and durable. You can add glass to a variety of things. Yes, windows, but you can make the windows as big as you want, choose to add a skylight to your ceiling, or add glass shelving into your home. Glass isn’t always as breakable as it sounds either. It comes in different sizes and thickness to be used for better insulation, variety, and even safety. If you are wondering about your next project, consider using glass to open up your home or bring in extra light to a living space. Here are a variety of ways to utilize glass products. Glass Shower Enclosures – Tired of your boring shower door or maybe you don’t like the look of a shower curtain. Consider getting a glass door installed into your home. If you have a smaller shower, this makes it look a lot more open and will also make your bathroom appear bigger as well. This brings a smooth clean look to a bathroom or shower. Glass Table Top – Wood table tops can get scratched so easily. They also absorb water and can get ruined. If you choose a glass table top not only looks sleek and modern but easily wipes off quickly with a towel and contrary to what you see in the movies, these tables are incredibly sturdy. Glass can be utilized in so many different ways. If you choose glass, your home will sparkle and shine when it is clean, bringing in more light and also making your home appear bigger than it is. Give us a call at 817-937-6267 for any questions you may have. Posted in Uncategorized on March 5, 2018 at 9:53 pm by Armstrong Glass.